This is a subject I've been avoiding for a while: Piracy on the N-Gage. It's more rampant than you can possibly imagine. Every single game that's out there now is available on some chat board, cracked and ready to load up on a big MMC to play on your N-Gage. Every single N-Gage user I know has at least some pirated games loaded. 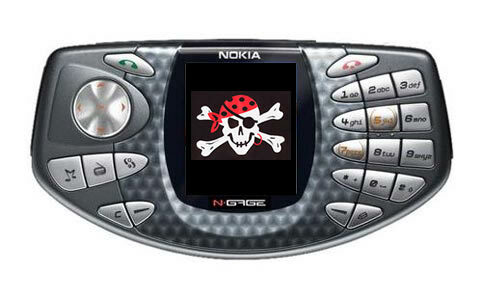 And I'd be lying if I told you that my N-Gage is pirate free. The temptation is just too great to snag a new game and pop it on to your deck to "just try out." Right, like I'm ever going to buy that game after it's sitting on my Taco. The guys at the local gaming store know about the piracy (and sort of promote it). Any N-Gage gamer you talk to asks if you've grabbed the latest game. Everyone who has a Series 60 phone who's any sort of hacker has messed with some of the Blizzard apps out there. It's nuts. It's beyond just being a dirty little secret at this point, it's actually almost a selling point of the system. I'm surprised you don't see banner ads on EBGames.com saying "and don't worry abou the cost of games, you can get almost all of them free!" I can honestly say I resisted until just a week or so ago. Everyone hates having to swap MMCs - it's like going back to the 80s - and I'm no different. So I first started using hacked games as a way of having all the games I purchased on MMC-ROMs available to me at once. And I've purchased more than few N-Gage games: Tomb Raider, FIFA 2004, Tiger Woods, Spider-Man, Pandemonium, Super-Monkey Ball and Tony Hawk. Being able to have all of them on one 128MB MMC with plenty of room left over for an album or two of MP3s is great. But then a few weeks ago the price started dropping on N-Gages, both QDs and the "Classic Taco" and more and more people started getting the decks and I started getting more and more pings from people with links to downloads for the latest games. FIFA 2005, Asphalt GT, SIMs Busting Out and more. And since I'm on a gadget moratorium, I caved. My MMC is now loaded and it's great (especially since these "second generation" games are so much better than the first round). It's the Napsterization of mobile games, and you know what? It's only going to get worse. But you know, I have to think there's a huge opportunity being missed here. These games are all 8MB to 12MB in size and are a quick and easy download over DSL. Even Nokia is seeing huge responses to the two demo games that they've made available for download at N-Gage.com (Call of Duty and Asphalt GT). These games aren't even packaged as .SIS installs! They're just a bunch of files you copy on to your MMC card. Tell me Nokia doesn't realize that piracy is happening already in huge numbers? This is exactly how the pirated games are being distributed as well - Nokia is just joining in the fun it seems. But my question is why stop there? Why not just provide the entire game as a downloadable app instead of messing around with the MMC cards? I said something like this when the N-Gage was first launched, and now look: That distribution medium is being forged with or without Nokia's involvement. They might as well take advantage of it. Even Sony is talking about distributing games to their new PSP over the wire - it's how things are going to be done. The pricing would need to change a bit, but I'd be quite happy to buy these games at half the price of the retail version online instead of pirating them. Look at the price of the pre-played games at EBGames... that's a good indicator of the "market value" of these games and they're all around $12 apiece. Perfect. This all goes back to Steve Job's model for iTunes. His main idea years ago was that people are fundamentally honest and that they would much prefer to pay a reasonable price for good-quality songs easily available online than mess around with pirating. This is exactly the case here. If every N-Gage game was available online, tied to my IMEI (I hate that, but you get the idea), and I could quickly and easily pay for it and download, I'd easily double my purchases and not have a single pirated app. This sounds like some sort of weird self-justification, but it's true: If I could download apps instead of being trapped using MMCs, I would never have loaded up a pirated game in the first place. But by sticking to an old, worn-out business model, Nokia has in fact encouraged piracy rather than protecting game developers from it. Let me tell you, regardless of whether Nokia addresses these problems, the piracy is going to do nothing but help them sell units (and maybe they know this). The software companies are going to be the ones that suffer most. But even with its smaller screen, if you compare all the video, music, 3D Games, multiplayer, internet connectivity, messaging and telephony functionaltiy and more that you can do on an N-Gage against the closed, single-function devices like the Nintendo DS and Sony PSP, people are going to choose the Tacos (and other Series 60 handsets - all 15 million of them). Really. It's a cheaper, more versatile, more portable, no-less-fun solution. And hell, the fact that you can load it up with an arcade's worth of tier-one games for free? It becomes even cooler. Please, don't kill the messenger.